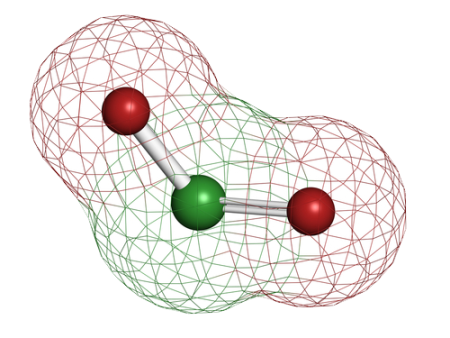 About Us » What is Chlorine dioxide? Unlike many decontaminating agents, chlorine dioxide has the unique ability to retain its sterilization capacity in water. In order to maximize process reproducibility and minimize materials effects when using the chlorine dioxide gas it is best to avoid pools or puddles of water. However, if small amounts of water are present the efficacy of chlorine dioxide is not affected. The reason that small amounts of water will not impact sterilization efficacy is that chlorine dioxide is readily soluble in water. The partition coefficient (CClO2(H2O)/CClO2(air)) of chlorine dioxide at 22°C and 101 kPa is about 38 (Masschelein). And provided that the quantity of water is small the gas concentration in the water reaches equilibrium quickly.